ITW Dynatec, a global leader in bonding and sealing solutions for the packaging industry, recently introduced a newer and more versatile Dynamini™ hot-melt adhesive supply unit (ASU). 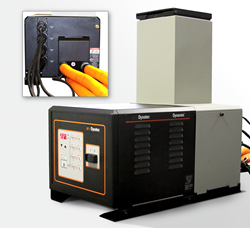 Designed to the highest industry standards for quality and performance, ITW Dynatec hot melt systems are simple to operate, highly customizable and represent a “best-total-value” for original equipment manufacturers (OEMs) in the packaging industry. ITW Dynatec’s latest generation Dynamini hot-melt ASU now features a four-hose configuration, allowing for greater operational capabilities, making it ideally suited for larger sized applications, as well as higher volume multi-point applications. Built for flexibility, the new Dynamini can be configured with Nickel or Platinum (PT100) temperature sensors, and is designed to integrate with other industry standard components. It features ITW Dynatec’s patented Melt-on-Demand™ technology, which virtually eliminates charring and significantly reduces energy consumption. Designed for optimal performance, reliability and ease-of-operation, this latest variation on a proven performer offers outstanding value in a compact ASU. The Dynamini ASU, now available in a four-hose or two-hose configuration, provides accurate, proportionate temperature control for the hopper, hoses and applicators. Sequential start-up delays may be programmed for turn-on of the hoses and heads. The temperature control can interlock the parent machine so that production automatically begins when adhesive has reached the programmed application temperature. Dynamini ASUs come in 110/120V and 200/240V configurations fitted with a quality piston pump. They also feature a self-diagnostic P.I.D. Digital Temperature Controller with platinum sensor accuracy and easily removable access covers that completely expose all components for easy maintenance. ITW Dynatec’s patented Melt-on-Demand™ hopper works in conjunction with the Dynamini ASU. With Melt-on-Demand, not all adhesive in the hopper needs to be melted for the unit function. This allows the system to be operation-ready much faster than conventional equipment. Exclusive Dynamini technology virtually eliminates the problem of charring. Because the heat is applied to the bottom of the hopper, the glue at the bottom is used first and char build-up on the sidewalls of the hopper is also minimized. Equipment maintenance is further reduced because the hopper needs to be drained to purge char with less frequency. ITW Dynatec, a division of Illinois Tool Works, Inc. (ITW), designs and manufactures a full range of industrial adhesive applications for the disposable hygiene products, coating and laminating and packaging industries worldwide. ITW Dynatec’s fluid dispensing systems are used globally in the manufacturing of a wide range of consumer and industrial products. A worldwide network of industry-leading customer service and support backs the company’s state-of-the-art technology. ITW Dynatec operates five world-class production facilities strategically located around the globe. For more information, please visit http://www.itwdynatec.com.